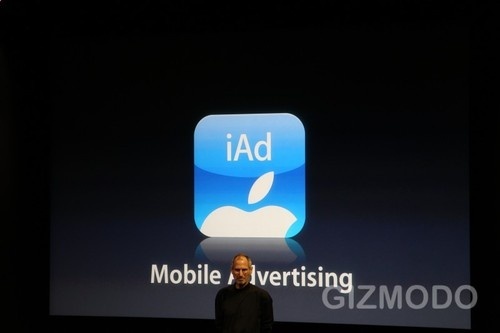 At today’s iPhone 4.0 event, Apple introduced the new iAd mobile advertising platform–and suddenly, every other announcement made sense. iAd is integral to iPhone 4.0, more so than we ever expected. The last “tent pole” in the presentation by Steve Jobs and Co. unveiled during the iPhone OS 4 presentation in Cupertino, Calif., on Thursday was the most important. All of those shiny new iPhone functions — the multitasking, the folders, unified e-mail, iBooks, Game Center — will satisfy lots of user desires. But make no mistake: It’s all about iAd. iAd is Apple’s long-awaited play in mobile advertising, the one running in the background of all it’s done recently. And it’s distinctly Apple-flavored. Just like Google’s strategy is based on its strength–search–Apple’s iAd is based on its bailiwick, apps. All of these ads will be in-app, and they’re a far cry from the typical banner ads Steve Jobs just decried as “boring.” The new ads will be based on HTML5 (in yo face, Adobe! ), and will be interactive, “emotional,” and built right into iPhone 4.0–where Apple controls every part of the ad. You might see, as per Jobs’s demo, a banner ad for Toy Story 3 while in an entertainment app, or Nike while in a shopping app. In the past, clicking on that ad was kind of a pain–it’d kick you out of whatever you were doing, vault you to the browsers, and you’d have to exit that, head back to the home screen, and restart your previous app just to get back to what you were doing. These new banner ads, when clicked, will keep you in your app–they’ll take full-screen, and look more like an app-within-an-app than just an image and link. You can watch videos, play mini-games, whatever, and when you’re finished, click the X in the upper left corner and the ad will disappear, leaving you where you started with no fuss. That sounds simple, but it wouldn’t have been possible before the iPhone added multitasking. After all, running an HTML5-based ad and an app at the same time really is multitasking. And it’s the new kind of iPhone multitasking as well–instead of truly running your app in the background, the OS simply freezes it in time, so when you get back to it, it’s just how you left it. That’s tailor-made for these sorts of ads–essentially it pauses your app, presents you with an ad, and then unpauses the app when you’re finished. The other elements of multitasking are also ready-made for advertising. Wonder why Apple only allowed a few elements of apps to run in the background, and how they chose those in particular? They’re all ad-based! Constant GPS can tell an advertiser where you are, so they can offer location-based ads, coupons, or deals. Imagine going to the market. Your phone becomes aware of your location and pushes your grocery list to you just as the store lets you know there’s a sale on Spaghetti-O’s on isle six. Push notification lets an advertiser interrupt you to let you know about ads. Advertising is the Svengali behind iPhone 4.0. In terms of the actual advertisers, Apple is actually going to sell and host the ads themselves, likely with the help of the recently acquired Quattro Wireless, and will take 40% of ad revenue. That means they’ll have lots of control over which ads go where–and can even impose an approval process on advertising similar to the one they have for the App Store. Will this spark a new golden age of advertising–not quite Mad Men but something more like App Men? (After all, it’ll be much more expensive to make an interactive HTML5 ad than a banner ad). We already know Google’s not too excited about this. Apple’s making a strong stand to not just revolutionize mobile advertising but own it. On one hand, it’ll surely bolster Google‘s argument against an FTC block of their AdMob deal. But then, of course, they’ll actually have to compete with iAd.